Jorge Villa is a project manager for Pearson Air. 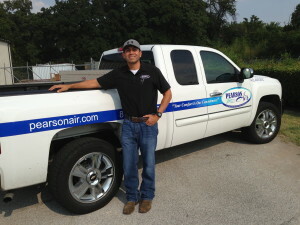 Jorge has served several roles for Pearson in the past, including NATE Certified Technician. Jorge has many years of service with Pearson and is a vital part of delivering 100% Customer Satisfaction to all our customers. Jorge and his wife have 3 wonderful kids and with whom they spend lots of quality family time. Jorge loves handling problems and solving complex issues that surface with HVAC systems and the difficulties of complex job site situations. Please contact Jorge with any questions that you have. How did you hear about Pearson Air? Please tell us what products or services you are interested in.